LHN uses the latest technologically advanced teaching tools to enrich the learning experiences of our students and to equip them with the digital literacy skills to succeed in the 21st century. All students receive a 13" MacBook Air to use at school and at home, which is customized with applications and books that are specific to their coursework. This allows their learning environment to reach far past the confines of the classroom and develop the digital literacy skills that they will need to succeed in the 21st century. LHN classrooms are equipped with state-of-the-art equipment, including digital projectors, Smartboards, and wireless technology. Our teachers participate in ongoing professional development, allowing them to explore the functions of the tools that are available and to learn how to harness the full potential of digital learning in the classroom. Outside of the classroom, learning continues with Edmodo, a web-based platform where students collaborate with classmates and their teachers, including posting questions and receiving additional help with assignments, reading summaries of lessons, taking quizzes, turning in homework and more. Students and parents can access grades 24/7 on any device through FACTS SIS, formerly known as RenWeb. 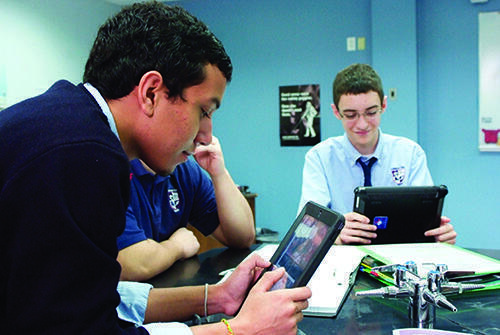 Students may choose technology-related classes such as Business Information Management, Desktop Publishing, Multimedia, Robotics, and Webmastering. These classes take place in our two computer labs that utilize both Mac and Windows platforms. Please note: The laptops are the property of LHN and must be returned in good condition (with chargers) as required by the technology department. We have compiled some resources for our current students and families to assist with any technology needs. Please contact the technology department if you have any questions. Before receiving a computer, each student and their parents are required to read the LEAH Schools Technology Handbook and agree to follow the Acceptable Use Policy.